Back in Rhode Island, there was never much to look forward to after Christmas. The holiday decorations came down, it was depressingly dark by 4:30 pm, and that once-fluffy-perfect-for-sledding-snow had turned into treacherous black ice. But there was always panettone. Panettone is an Italian sweetbread made with candied orange, zest, citron, and raisins that is closely associated with Christmas and New Year's Day. Growing up in Rhode Island, my family received a lot of panettone for Christmas because it was a go-to gift among Italians. Need a gift for your lawyer? 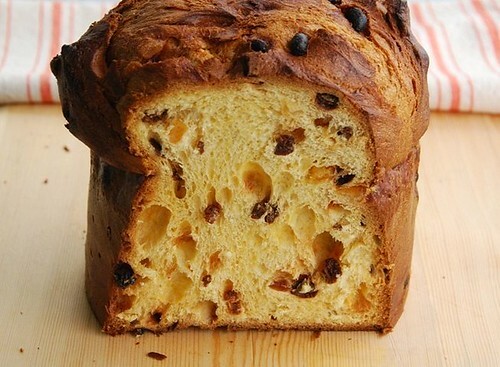 A loaf of panettone is perfect. Invited to someone's house for coffee around the holidays? Bring panettone. Have an exceptionally good mailman? Give him a loaf of panettone, plus a shot of anisette when no one's looking. That always warms him up a bone-chillingly cold route. Though panettone is delicious unadorned, I always preferred it toasted with a dab of butter or some orange marmalade. However, my favorite way to eat it was my mom's panettone French toast. She would cut super thick slices (because, really, where's the fun in thin French toast? ), dip them in a mixture of egg, milk, cinnamon, vanilla, and orange zest, then cook them until golden brown and plump. All they needed after that was a drizzle of pure maple syrup and a dusting of confectioners' sugar. And that is exactly what I'm sharing with you today. If you didn't receive any panettone this holiday season, then go to your nearest Italian specialty market or deli and buy a loaf. Chances are they'll still have leftovers from Christmas, so you may even get one on sale. I received mine thanks to the generosity of Maryann and Joe, when I participated in their Italian Feast of the Seven Fishes in December. Since I won't be getting fresh falling snow any time soon here in San Diego, I may have to walk over to Little Italy for another loaf of panettone. After all, winter still has a way to go. In a shallow bowl or pie plate, lightly whisk eggs; add milk, cinnamon, vanilla, and orange zest and whisk until well combined. Place griddle over medium-high heat. Melt a little butter on the griddle until just coated. Dip one slice of bread in the egg mixture, allowing the excess to drip into the bowl, then place on the hot buttered griddle. Cook for 1 minute per side, or until golden brown and the egg has set. Place on a warm plate and cover until ready to serve. Repeat with remaining slices, buttering the griddle as necessary. Cut each slice into 2 triangles. Place 12 triangles of French toast on a serving platter. Drizzle with maple syrup and dust with confectioners' sugar. Serve hot. I think this is a wonderful way to enjoy leftover pannetone Susan...I love the flavour of vanilla, cinnamon and orange! i always look forward to the week when the italian deli near me rolls out the pannetone... it always means christmas to me. this sounds tasty!! Proud Italian Cook, Taste w/ the Eyes and I made the same thing on Christmas morning! I still have a piece of pannetone leftover! maybe I will sneak it in one more time! You may have sealed the deal... I thought having friends over for brunch would cure my post-Christmas blues and this looks like the perfect thing to serve! Yum! That looks mighty scrumptious! 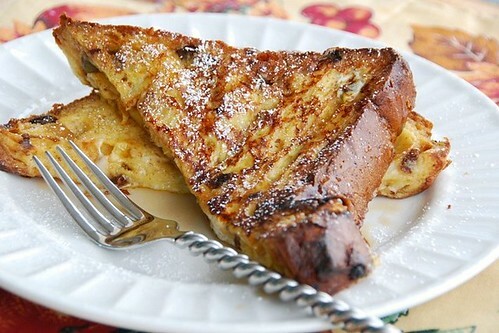 You can't beat Panettone French Toast! sounds absolutely decadent. i have made french toast using raisin bread but this is putting it up a notch! lovely! You're right, there's no fun in thin French toast. Love Pannetone on its own but turned into French toast is simply irresistible! Well, what a great way to start 2009! If only I could get it delivered to me whilst snoozing. Wishful thinking! I always see all the beautifully wrapped pannetones in our local Italian grocers in all different price ranges.I think it an ingenius idea to make it into delectable French toast!! Wonderful for french toast...with a berry sauce, dollop of ice cream - yum! Happy New Year, Susan! I've always wondered about pannetone, but after your description, I know I need to try it. It sounds so delicious! I'm curious though...is this something easy enough to make from scratch, or is it easier to buy it already made? I LOVE panettone. I have a favourite Brazilian brand that is the best of all, I even "import it" when I cannot find it here in Seattle. However, I made a dessert with them and brought to a Xmas dinner and was surprised to find out that no one knew what a panettone was. French toast sounds a great idea for leftovers, but there is none left in my family. Oh...susan..I am feeling quite depressed after the Holidays...but this surely will brighten up my day. Hi Susan - we are all on the same page with this one - you, Marie, Stacey, and myself...I bet there are more out there too. It's definitely a winner! I am liking the idea Susan! I just know it, must taste really great. Very nice. And, I didn't get any this year! Here in the home territories (Rhode Island!) pannetone is still everywhere, even at our brand new Trader Joe's, which today was selling it for $5.99. I think your recipe would make a great dessert, yes? I have been away from bloghopping abit, so let me wish you a wonderful New Year, Susan. This sounds like a heavenly breakfast. I can't wait to try it. Very clever! I'm trying hard to use more leftovers and let less food go to waste but it's certainly not easy! What a way to use Pannetone! Looks absolutely delicious - I think my guys would love this. I'm glad a REAL Italian also prefers a little dab of butter on her pannetone - I thought I was preachign heresy ;-) And I *love* the idea of making French toast with it! The loaves are always so big that you are bound to have leftovers. Thanks for the inspiration and I hope you had a fantastic festive season! I've never head of Pannetone....Looks yummy Susan.Happy 2009.Looking forward to more recipes! Now that's a great idea! It's clear that cooking genius runs in your family. Happy New Year, Susan! I'm more than a little bit angry that after entering your contest on 'eat-more-burgers' for free beef, that I have been INUNDATED with foreign spam email. I get 5-6 emails each day from various foreign countries congratulating me on my lottery win & wanting my financial info so they can transfer my winnings. Since I haven't given out my email address for anything else over the last year, I must conclude that you are selling or providing access to our info. Has anyone else reported a similar problem? Oh man that looks soooo good! This is the first year in a long time that I didn't buy or get a pannetone. We usually eat it on New Year's Day, and my son was asking where that fabulous bread was hiding!! Makes me wish I had bought some panettone this year! On a similar vein we've also make bread and butter pudding with it in the past which was really good (and a bit lighter than normal). karen-I am definitely trying bread pudding next year. chris-Yum! I'd love to try it. chris-Coconut jam? OMG, I would love that! Happy travels! heather-I know. They beat the heck out of candy canes! kara-Hope you try it! They'll love it! meeta-It definitely elevates it to something special. mark-Well, you can never have too much French toast. lore-The thicker the slices, the better. david-Yes, that would be heavenly, indeed. val-Go and buy one before they're gone! 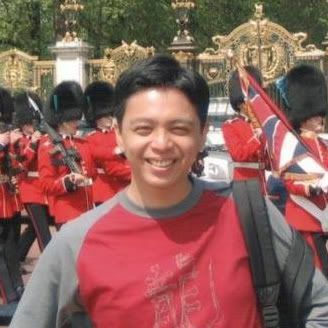 ronell-I love French toast with berry sauce too. leena-Go try it. Right now! I think it's easier to buy. mary-Better get to an Italian deli soon then! lydia-Even TJ's? Wow! Yes, it would make a lovely dessert. You could add a dollop of whipped cream. dragon-It's really one of my favorites. julie-That's sweet. Thanks! And Happy New Year to you too! val-Of course, I am not selling your info to anymore. It is common knowledge that spammers search the web for email addresses. If you'll notice, most people spell out their email addresses. For ex. FoodBlogga [at] yahoo [dot] com. I am happy to delete your comment from the post. Just email me to indicate which one is yours, and I'll still keep you in the pool for the drawing. nic-Smart kid! :) Happy New Year, Nic! sophie-That is wonderful too. So homey and comforting. Any idea how much longer Pannetone will be around? I saw it in the store the other day and keep debating whether or not to get some. hillary-Many stores carry it for months; some even carry them year-round. So it really varies. To be on the safe side, I'd get it by January. I had a lovely Pannetone Toast this morning. Nothing else - as simple as that. Some mornings are better than others and this one definitely was. ooh, panettone and french toast..nice concept!